Why Are My Glasses Cloudy After Washing in the Dishwasher? It's frustrating to hold up a glass that should be sparkling and clear, only to see a cloud of milky film covering the glass surface. Cloudy glassware and dishes can be caused by several conditions, but the most likely culprits are related to hard water or etching. Is It Hard Water Deposits? One of the most common causes of cloudy dishes and glassware is hard water or water with high mineral content. The problem with hard water is twofold. First, minerals in the water reduce the effectiveness of detergents so that more detergent may be needed to get the dishes clean. Hard water also doesn't rinse as well as soft water, with the result of a film of soap or dirty water left on the dishes. Paradoxically, adding too much detergent with hard water only compounds the rinsing problem. Second, the minerals in hard water can dry onto the surface of glassware, creating a cloudy film. One way to test for hard water is to soak a clear glass in vinegar for 5 minutes. If the cloudy deposits are removed, then hard water likely is your problem. Add more detergent: More detergent may be effective at removing hard water deposits from your glasses. At the same time, using too much detergent may leave a soap film on the dishes, so experiment with different amounts to find the best balance. Use a rinse aid: Rinse aids come in solid and liquid forms. They help reduce spotting and etching by breaking the bond between water and the dishes. Most rinse aids are added with each dishwashing load. Check your water temperature: Run the water at your kitchen sink for 1 minute. Put a candy thermometer in a glass and run water into the glass to measure your incoming water temperature. 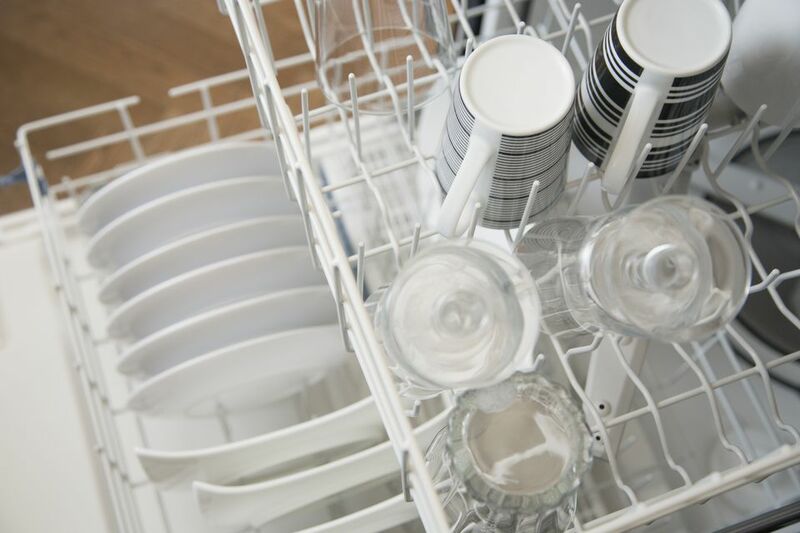 Many dish detergent manufacturers recommend a temperature of 130 degrees, but rather than turning up your hot water heater unnecessarily high, use the high-temp setting on your dishwasher to heat the water no higher than 140 degrees. If your water heater is far from the kitchen and it takes a while for the hot water to arrive, run the kitchen faucet for a minute or so until the water is hot, then turn on the dishwasher. If the cloudy film on your glassware isn't removed by the vinegar, your glasses may be etched. Etching is a wearing away of the glass material, resulting in tiny pits and scratches that cannot be removed. It can be caused by very soft water, very hot water, too much (or the wrong kind of) detergent, or excessive pre-cleaning of dishes. Don't rinse or prewash so heavily: Modern dishwashing detergents contain harsh alkaline salts that are neutralized by oils and food particles on the dishes. If you remove all food residue from dishes before loading the dishwasher, the detergent has nothing to neutralize it, resulting in a harsher effect on the dishes themselves. Use less detergent: This is especially true if you have soft water. Less soap is needed with soft water, so experiment with different amounts of detergent until you have just enough to get the dishes clean. Try a different detergent: Some detergents cause etching more than others, depending on the softness of the water and other factors. Try a milder detergent (with a lower pH number) or a detergent without phosphates.